Joining Salem among WGN America's slate of original programming is Manhattan, another period piece for the network. The scripted drama centers on the lives and top secret work of the men and women involved in the Manhattan Project during World War II. Mixing an intriguing historical setting with suspense, drama and mystery, where the stakes are incredibly high, Manhattan boasts a solid cast, led by the John Benjamin Hickey and Olivia Williams, and a compelling story brimming with potential for a great TV drama. 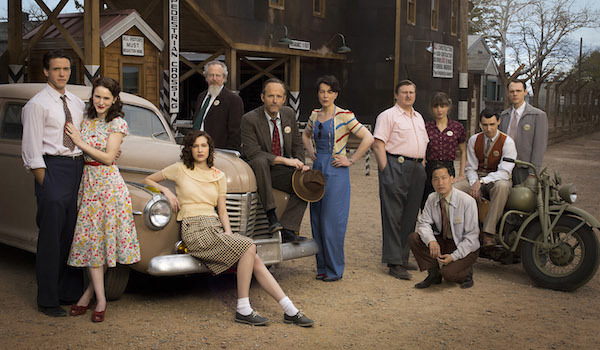 Created by Sam Shaw, Manhattan introduces us to the mysterious desert-set New Mexico community that is "The Hill" through the arrival of Charlie Isaacs (Ashley Zukerman), a brilliant young scientist who moves to the mysterious bubble of a town with his wife Abby (Rachel Brosnahan) and their young son. Charlie and Abby have no idea what they're in for when they arrive at the military-guarded community. Upon arrival, Charlie is introduced to the cluster of ambitious scientists working on a classified project, while Abby is soon made aware that the wives of this town are rarely privy to what the men are working on. We're eventually brought in on the reality and severity of the situation at hand. These scientists are in a secret and incredibly intense race to build an atomic bomb, which they've codenamed "The Gadget." Science, the military, family and other personal matters blend together as Manhattan imagines the life and work of the people involved in an incredible crucial, high-stakes task. John Benjamin Hickey delivers a fantastic performance as Frank Winter, the genius who's among the leaders of the Manhattan project. While much of the first episode focuses on Charlie's introduction to his new, stressful work environment, the layers of Hickey's character begin to emerge as we see him trying to deal with the mental and emotional challenges of his work. Like Charlie, Frank is a husband, a father and a genius, but unlike Charlie, Frank is knee deep in this situation when the series picks up, and we see the toll the secrecy, pressure and impending ramifications of his work have taken on him. There are life and world-changing decisions being made on The Hill, and it's made evident that Frank is extremely aware of of that. Supporting Hickey's excellent performance is Olivia Williams, who shines as Frank's intelligent and caring wife Liza. While Liza is also a scientist, her work as a botanist has been put on hold for now, as she attempts to play the supportive wife to her husband. But there's only so much support she can really offer him, as he can't let her in on what's going on at the "office" and thusly, he can't really lean on her for the emotional support he needs. An unfamiliar distance is growing between them as neither seems to know how to reach out to the other under these circumstances. Rounding out the cast are Katja Herbers, Alexia Fast, Christopher Denham, Harry Lloyd, Michael Chernus, Eddie Shin and Daniel Stern, the latter of whom plays physicist and political liaison Glen Babbit. To say that there's a lot on the line in this story is an understatement, and Manhattan makes that clear in just about every scene. With that said, Manhattan sets an even pace, which feels necessary given the tone and subject matter, but as a result, it may take a bit of time for viewers to develop their investment in the series. That's less a criticism as it is an explanation for why I'm not entirely hooked yet. I expect to be, but I need to see more. More importantly, I want to see more. There's rarely a moment in Manhattan where we might forget that there's a war going on, and that the work being done on the Hill could play a vital role in the outcome. That level of tension colors the character drama at every turn, which is what makes Manhattan stand out from other period dramas, and that's reason enough to give this series a shot. Factor in the cast and the potential for interesting character developments, and Manhattan is well worth a look.